Crowded shopping malls, radio stations pumping songs about sleigh bells and chestnuts, inclement weather from coast to coast -- all signs point to one explanation. We're smack in the middle of the holiday season. Whichever holidays you observe, you might be surprised to learn of another one to add to the roster. Two hundred eighteen years ago today, the founders ratified the Bill of Rights, which the United States officially celebrates every December 15 as U.S. Bill of Rights Day. We have President Franklin D. Roosevelt to thank for officially creating the holiday, which he inaugurated in 1941, on the 150th anniversary of the document's ratification. I took a spin through Google News Archive Search to learn more. 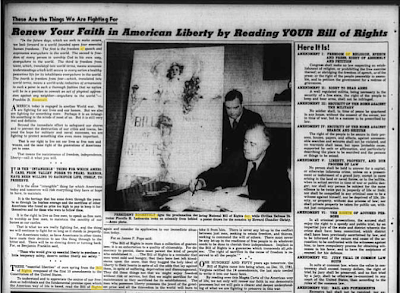 Searching for "Bill of Rights Day 1941," I was able to drill down to autumn of that year, where I hoped to find articles explaining how the holiday took shape. Sure enough, the St. Petersburg Times ran an Associated Press story on November 29, 1941, quoting a proclamation from President Roosevelt. In what appears to be a clear reference to the events of World War II, Roosevelt mentions the "privileges lost in other continents and countries," and how Americans "can now appreciate their meaning to those people who enjoyed them once and now no longer can." And so December 15 would become "a day of mobilization for freedom and for human rights, a day of remembrance of the democratic and peaceful action by which these rights were gained, a day of reassessment of their present meaning and their living worth." Little more than a week later, of course, arrived "a date which will live in infamy," the attack on Pearl Harbor, which brought the United States into the war. So when Bill of Rights Day arrived eight days later, the holiday had renewed meaning. Once again, in the St. Petersburg Times, you could find a full page featuring another proclamation from Roosevelt, the full Bill of Rights reprinted for readers, and a picture of Roosevelt with New York Mayor Fiorello Henry La Guardia. And the day after the holiday, this write-up summarized various ways that the country marked the occasion, including Chicago school girls reading the Bill of Rights "publicly at State and Madison streets." It's interesting to see how the meaning and observance of different holidays continue to change, sometimes even just days after they have been created.